There’s nothing quite like having a delicious evening meal after a long day at the office. 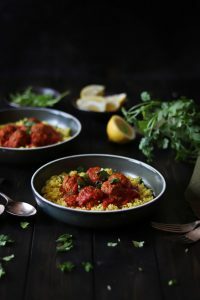 And what could be more divine than meatballs in a tasty tomato sauce (made using our award-winning bone broth) served with a zingy couscous? 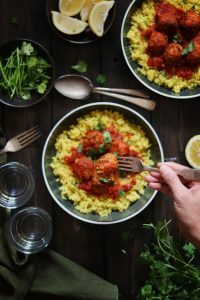 For this week’s recipe, we’re trying this beautiful dish, made by the hugely talented food stylist, photographer and award-winning blogger Shilpa Kiran (you may know her from soulfulandhealthy.com), who we are lucky enough to collaborate with here at Sadie’s Kitchen. 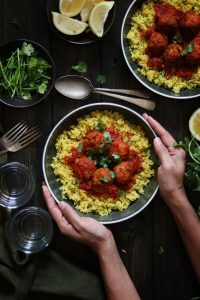 Add all the meatballs ingredients in a large bowl, preferably using your hands, mix well. Form small golf size balls, place on a lined baking tray, drizzle the oil on top and grill in pre-heated oven for about 15 to 18 mins, checking in between. Add the tin tomatoes, break the whole plum tomatoes with a wooden spoon. Add the chicken stock, chopped coriander leaves. Let it simmer on low heat until the meatballs are ready. Once the meatballs are ready add them to the sauce and let it cook for about 8 to 10 minutes. Bring the stock to boil, add the couscous, stir well and cover with the lid, turn off the heat and let it steam for 10 to 15 mins. They can stick together so use a fork and gently fluff the grains. Add the lemon juice, fresh coriander, stir well. 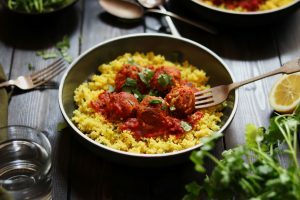 Add the couscous over a plate and then pour the sauce with the meatballs over, garnish with fresh coriander leaves. Enjoy!